Your Certification is Just Around the Corner! Electronic Certified Bulldog Clean Seal for your website. (A Snippet of code will be provided for your Webmaster which includes the genuine electronic seal). 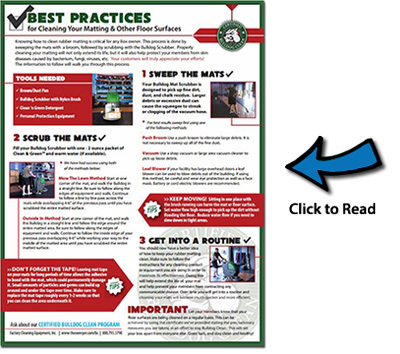 I pledge to follow the best practices as outlined in "Best Practices for Cleaning Your Matting and Other Floor Surfaces", run our machine on a regular basis (at least 3 times per week) and use a cleaning agent that is safe for my members.